If you’re an iOS (iPhone, iPad) user, you might already be aware that apart from iTunes Store purchases, iOS does not support direct downloads by default. Safari for iOS can usually open a few popular file formats (such as Zip, PDF, DOCX, etc.). For these file types, you also get the Open In option within Safari, so that you can export the file to a different app (for example, a file manager app). And for media (audio, video) files, Safari allows you to play them directly within the browser. So if you want to download media (.mp3, mp4, etc.) and other unsupported (ISO, RAR, Zip, etc.) file formats, Safari for iOS won’t help you to do so. That’s when third party download manager apps are useful. These apps can help you manage file downloads and keep them organized in one place. In this article, we’ll list a few of the download manager apps for iOS (iPhone, iPad, iPod Touch) that support multiple file formats, and have suitable file exporting options like, Open In, Save to Camera Roll, WiFi sharing, etc. By description, Documents app is a powerful file manager for iOS that can be used to open multiple file formats. But in addition to being a file manager and viewer, Documents also has a powerful file download manager. The app has a built-in web browser, using which you can visit a specific webpage and just tap on a download link to download the respective file. It also supports resuming of interrupted file downloads, provided the server allows it. The following steps will guide you to download files on iPhone, iPad and iPod touch using the Documents app. Launch the app and access the built-in web browser from the bottom right corner. Navigate to your desired download page and tap on the download link. Alternatively, you may also paste the direct download URL in the address bar. Documents app will now ask you to save the file. Tap on the Done button in the top-right corner to start the download. You can access the download list by tapping the Downloads button on the lower right corner of the browser window. Once a file is downloaded in Documents app, it will be available in the app’s local storage. And being a versatile file viewer and media player, Documents app will be able to open most of the files that you download from the web. But in the rare occasion that it can’t open a particular downloaded file, it’s also possible to export them to other apps using the Open In feature. Alternatively, you can transfer downloaded files from Documents app to other devices (Mac, PC, etc.) via WiFi sharing or using iTunes. Documents app supports Save to Camera Roll option for downloaded photos and videos. You may even transfer multiple photos and videos from your computer to Camera Roll. Additionally, you may use the Open In feature of Documents app to send mp3 files over WhatsApp on iPhone. Documents is a great file manager with many useful and productive features. But it can’t grab media files automatically from websites like IDM does on desktop. So, if you are looking for a download manager that can automatically fetch and download media links on iPhone or iPad, you may try apps like iDownloader or VDownloader. iDownloader is a download manager app dedicated for grabbing audio (.mp3) and video files. It supports multiple media formats and can be useful for downloading embedded streams from websites. Just like Documents app, iDownloader has a built-in web browser where you can paste website URLs or direct download links to download media files within the app. 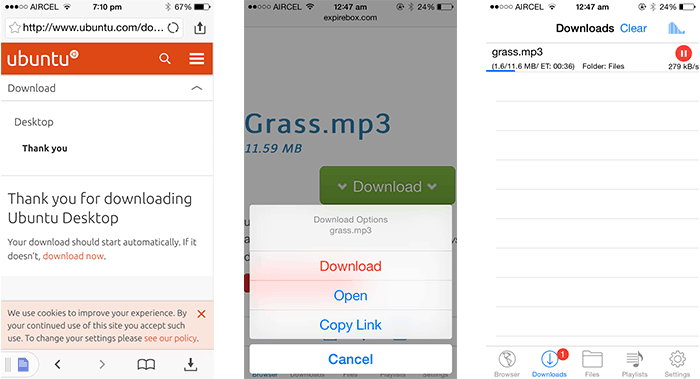 When you tap on an audio (.mp3) download link, iDownloader will prompt you to download the file automatically. On the other hand, if it’s an embedded video, it will open the media player in a separate window and prompt you to download the file. Once the file starts downloading, you can view its progress in the Downloads page; when completed, the file will be saved to the app’s local app storage. VDownloader is another download manager app for iPhone and iPad available on the App Store that is almost similar to iDownloader for iOS, but is a dedicated app for downloading only video files. Online Stores: Services like iTunes, Amazon Instant Video, etc. let you purchase and download movies from their online stores. For such type of digital downloads, you’d usually have to use the official apps provided by the respective services. Direct Links: If you have a direct download link for the video you want to download, Documents app for iOS would be a suitable choice as it can download almost any type of file with auto-resume capability. Embedded Media: If you want to download a video that is embedded within a webpage, media grabber apps such as iDownloader or VDownloader are most suitable. Torrents: If you want to download files via torrent, there are a few workarounds that help you to do so on your iPhone, iPad or iPod Touch. Though there are many apps on the App Store that claim to be good file downloaders, these are the decent file download managers that we could find. If you found these apps useful, or know about other apps that were not mentioned here, tell us your opinions in the comments below. Disclaimer: This article describes the possible ways of downloading different types of files on iOS devices. We do not encourage the use of aforementioned methods to facilitate illegal downloads in any way. 7labs bears no responsibility for any misuse of the information provided in this article.